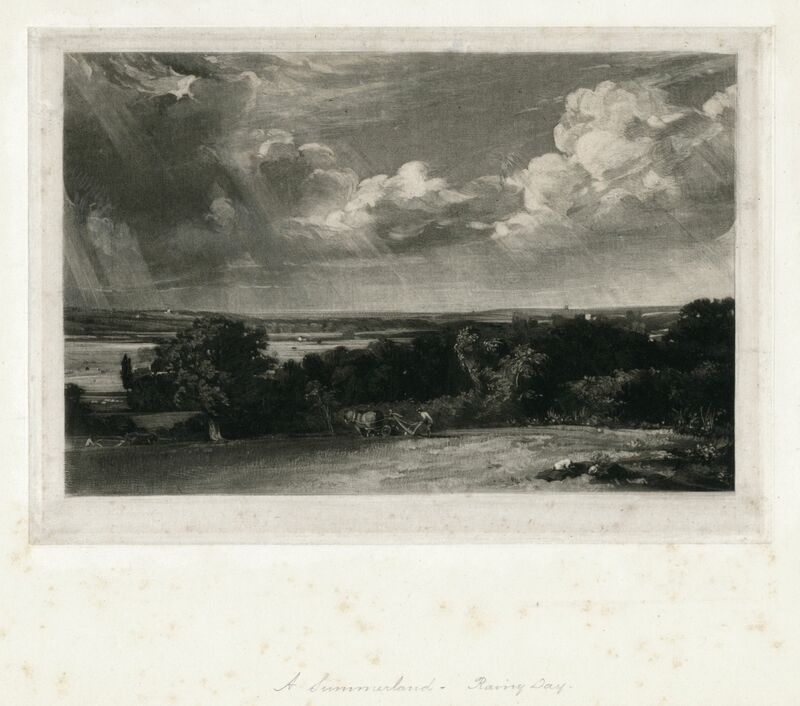 This is the third in a series of articles in which I discuss a recently-discovered progress proof of the mezzotint of ‘A Summerland’ made by David Lucas for John Constable in 1829. Here I continue a collation of the many stages through which the engraving evolved to publication. This involves concentrated tracking of changes to the image and working out the order in which they occur. It’s not likely to appeal to everyone, but then the wider public has almost completely lost sight of the work, artistry, consummate skill and sheer endeavour that goes into the production of a hand produced engraving. Today, images proliferate almost infnitely, and most without any material substance. Constable’s ‘Summerland’ belongs to an age when all images were hand produced, hard won and highly crafted objects. More even than that, the art of hand producing and printing engravings was at its absolute peak. Within a few short years the process was industrialised and automated and overtaken by new image technologies. For now, however, these prints bear witness to some of the greatest heights that this particular image craft ever reached. It more than deserving of some effort of appreciation. When Lucas next touched this plate it was to again increase the dramatic activity in the sky. Up until now the plate remained close to the original painting that Constable had provided, but from now on the sky became a new conception altogether. In what follows I start with state (d) as given by Hon Andrew Shirley in his book , ‘The Published Mezzotints of David Lucas after John Constable’, Oxford, 1930, and find room to add six new states to that before his next, state (e). This represents the most crucial phase in the development of the image. Shirley’s next state (d) is identified with an impression at the British Museum, which is listed in their online catalogue as BM 1842.1210.104. Like state (a) described above, this was bought by the Museum from Constable’s friend and patron James Baker Pulham, only five years after the artist’s death. The most obvious differences are in the sky. There are now dramatic crepuscular rays upper and lower left, centre left and across the entire undercloud area along the horizon. In addition there is an extensive area of cirrus cloud in the open sky upper left, and extensive linear underlighting of the clouds across the whole of the composition and extensive lightening of the sky above the horizon, especially in the centre and to the right. In the landscape there are several enduring changes that may be tracked through later impressions. On the horizon towards the left there is a new white building immediately at the centre of the ray of light. This reinstates a building that was there in states (a) and (b), but lost in state (c). On the right horizon is a new tower with a highlight at its tip. In the middle distance the lights on the fields have been strengthened; to the left immediately above the sheep and further off beyond the cows, and there is a similar heightening of the contrast in the middle distance centre. The most important difference in the foreground is the introduction of a new light on the back of the central ploughman. This brings him into more dynamic play in the composition. Apart from that there are a couple of new lights in the trees cutting the horizon at the extreme left, the light stoke of the distant river has been lengthened and brightened and a there is a slight reduction of the right-hand light in the light building below right of the new tower towards the right. The signature is still plainly readable. Shirley (d) also mentions ’A proof touched in white chalk to show changes in sky. – Horne’ Shirley pp.155-6 speaks of: ‘The very fine collection, also made during the dark ages of Lucas’s reputation by the late Mr H P Horne, was unhappily catalogued in haste a few days before it was dispersed at auction; the present writer regrets that, for this reason and since it was the first collection with which he attempted to deal, he cannot claim complete reliability for his notes on it, except in those cases where he was able to see the proofs again at the Metropolitan Museum, New York.’ Only one of the Met’s ‘Summerland’ prints was accessioned before 1930 (25.51.15), but the provenance of that does not mention Horne. That is, however touched with chalk, and wants consideration later, rather than here. This is described by Gerrish’s online catalogue as Shirley’s state (d) but there is sufficient new work to the plate represented by the British Museum example (1842.1210.104) to constitute a different state and warrant a separate numeration. The landscape forms are unchanged, but there is considerable new work in the sky. There is some elaboration of the lights at the upper left, more work in the cirrus clouds upper left, trails of cirrus in the right part of the open sky, darkening and dramatizing of the sky above the horizon from the centre to the right, new work in the central clump of cloud, the bridge between it and the right clump, and more work towards the right in the right-hand clump. This state brought the composition to a high degree of resolution and refinement, but Constable was still not satisfied. Another impression of the same state is at the Fitzwilliam Museum (P1383-R) but touched with white chalk and graphite to indicate changes. Constable adds a new crepuscular ray towards the left, eliminates the lower strands of cirrus in the open sky, and seeks to lighten again the right-hand horizon. Nor, significantly, is the signature visible in this impression. It has presumably been blotted out by Constable, but the instruction was not heeded immediately, for it is retained at least through a couple more states. 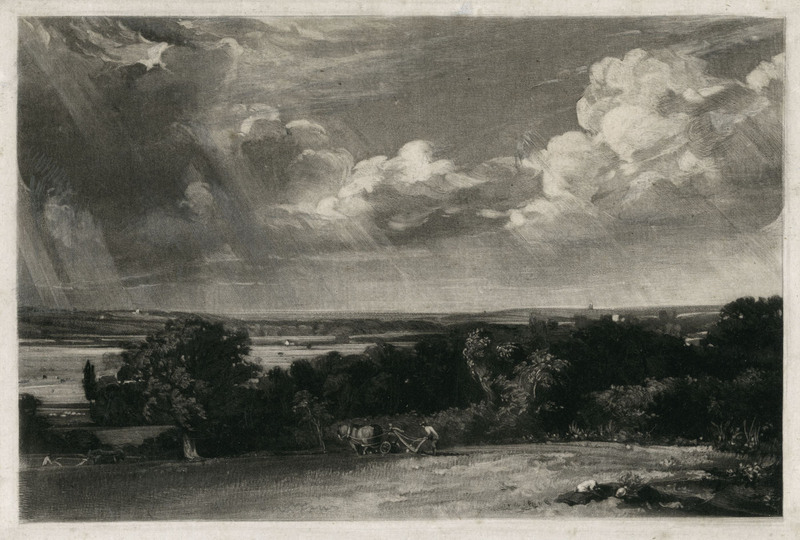 David Lucas after John Constable A Summerland, 1829 Mezzotint, printed in black ink on paper Image, 150 x 224 mm, on plate 177 x 251 Metropolitan Museum of Art, New York (40.9.5) Image courtesy of the Metropolitan Museum of Art. Shirley did not know of an impression at the Metropolitan Museum of Art in New York (40.9.5). This was bought by the Museum in 1940 from the dealer Knoelder, who in turn had it from the British collector John Charrington. In 1910 Charrington was the source of the core collection of proofs at the Fitzwilliam Museum. These appear to have descended from David Lucas to H S Theobald. Quite how or why this has a separate Charrington provenance is unknown. This impression represents a strike immediately after the revisions proposed in the Fitzwilliam touched proof (P1383-R). The underside of the crepuscular ray to the left of centre has been lightened as indicated, the cirrus upper left has been toned back, and that to the right of the open sky eliminated. The sky towards the right horizon has been much lightened, and a bright streak introduced behind the right-hand tower, and at the extreme right is the first appearance of a distinct upturn to the undercloud, which persists throughout the subsequent states. The most striking new work, however is to be found in the central clump of cloud bridging across to the right half of the sky. Here the new work is bold and unresolved; still raw upon the plate. The signature is still clearly visible at the lower right. This impression in a private collection was unknown to me when this article first appeared in October 2018. It was communicated to me by a reader in January 2019. Its appearance justifies the decision in the original articles not to attempt an entire new numbering on the grounds that new states are almost bound to materialise. As it turns out, inserting new examples is not as straightforward as I hoped. This one sits between The Metropolitan Museum’s 40.9.5, here called d (ii), and the V&A’s 819.2016, here called d (iii). I have eventually decided to call the new state d (iib), and leave the Met impression as d (ii). That leaves an option open in the event of another state turning up between these! There are several material alterations to the plate between the Metropolitan Museum print and this. The bold swathe of new tone in the centre right of the sky that was introduced in the former is still present but considerably ameliorated in the darker tones further right. The most obvious new feature is the crepuscular ray at the far left, but there are other elaborations and refinements in details all over the sky. Two small details are the reduction of the width of the light on the church tower on the left horizon (above left of the large tree) and the reduction of the tower of Stoke by Nayland church on the right horizon. 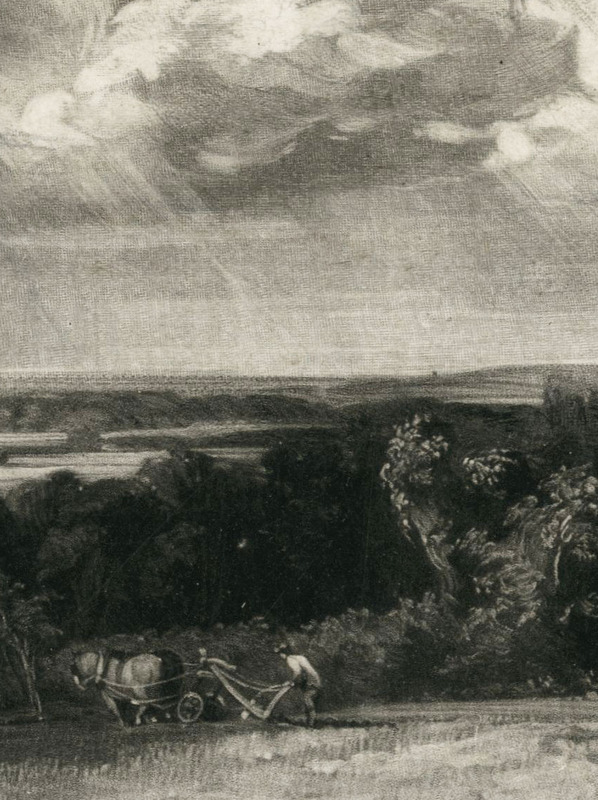 Perhaps the most telling detail of all is one of the smallest; that is the introduction of a dark tower on the horizon to the right of centre, just above the left part of the pollarded tree to the right of the ploughman. This is its first appearance in the sequence and it subsists throughout all later impressions. It might be a small detail but it adds greatly to the composition by pulling the eye into the furthest distance, and by so doing renders sublime the pictorial space. That would provide quite sufficient reason for Constable to have invented it and it does not figure in either version of the composition in oils. It remains tantalisingly possible, however, that this detail might be grounded in observable fact. There is a mark in the original sketch that might indicate a church tower on that bearing, and looking at the maps, the line of sight leads directly to the tower of Great Henny church some 12.9 miles distant. I have not yet managed to find a window of good weather to make my promised site visit, but it will be quite something if Great Henny church can actually be seen. The impression has been extensively touched by Constable in white chalk (or watercolour) and graphite. On the evidence of the next state, V&A 819.2016, the light marks rather counter-intuitively, have been adopted as added darks, whilst the graphite marks as areas for making lighter. The print is inscribed in pencil with the title ‘A Summerland. Rainy Day’. The hand is not that of Constable. 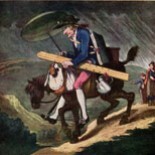 The form of title specifying the subject as a ‘Rainy Day’ was first used by him in the prospectus for the complete edition in 1833. In correspondence Constable initially calls it ‘The Summerland’ before settling generally on ‘A Summerland’. There are still several states to be considered before Shirley’s next (e). This impression represents the implementation of changes indicated in the private collection proof, but also introduces a good deal of new work into the sky. There are numerous enduring changes of detail and emphasis. There is a huge variety of new highlights and detail in the sapling to the left of the plough, in the hedge and pollarded tree as well as the whole range of trees across the mid-distance. In the middle distance at the left the stream has been made more prominent and two cows added in the meadow below it. Further right, the tower of Stoke by Nayland has been further reduced by completely eliding the highlight at its tip. The major work is in the sky. The rough new work in the Metropolitan Museum impression has been still further softened and ameliorated, and the crepuscular rays better defined, and mingled with drifts of rain, both by being lightened with a burnisher and darkened with a fine roulette and drypoint. The prominence of the rays against the dark cloud and as they fall to the ground is greatly increased. Most obviously there are light streaks of cloud now against the darker cloud mass to the left, and the continuation of this into the open sky centre is much more detailed and defined. There is a new patch of dark tone in the cloud to the right, which is softened in subsequent states. Signature still visible at lower right. This is a comparatively lightly inked impression, which lacks the tonal richness and power of most others, but in compensation exhibits an astonishing clarity of detail in the darker areas, greater than any seen thus far. Looking back through previous states, it seems obvious that most, if not all, of the shadow detail has been present since the earliest states. It is just that the plates tend to be densely inked in the darker areas. This impression represents a refinement of V&A E819.2016. There is more work softening and melding in the sky. By now it is apparent that the central horse is being progressively lightened. Because of the variations in the degree to which the different proofs are inked, it is hard to be certain exactly to what degree the lightening occurs in each state. Suffice it to say that in the Metropolitan Museum proof 40.9.5, the horse is definitely brown. By the V&A proof E819.2016 it is definitely white, and by Fitzwilliam Museum P139.1954, it is distinctly so. Between The Metropolitan Museum proof and V&A 819 Constable seems to lighten the rear quarters; in V&A 818 he lightens the whole horse, and in Fitzwilliam Museum P139.1953, lightens it still further. Signature still visible at lower right, albeit not so clearly as in previous versions. Fitzwilliam Museum P139.1954. Posterior to V&A E818.2016, since the central horse now made emphatically white, the white building at right now toned down and likewise the trunk of the large tree at left. On the horizon the prominence of the light church towards the left has been reduced by toning down its ancillary building. This is a very well inked impression, perhaps overly so, especially in comparison to V&A E.818, and the darks are rich and velvety, which makes the light horse very much the focal point of the whole composition, and the chiaroscuro very much more dramatic and structured. There is a corresponding loss of fine detail in the shadows, but this seems to have been Constable’s certain intention, for looking back at the lighter V&A impression the attention seem completely distributed and distracted, and as a result the force of the composition as a whole dissipated into its (albeit beautiful) details. The Fitzwilliam Museum has another impression (P140.1954) that is almost identical to P.139.1954 except for the first introduction of three stones in the foreground and a few extra lights in the hedgerow towards the right. Another significant difference is that the signature bottom right is now elided. The Metropolitan Museum has an impression (40.9.6) that was unknown to Shirley. This was acquired in 1940 from the dealers Knoelder and bears the blind stamp of the well-known British collector John Charrington. This appears almost identical to Fitzwilliam P.140.1954, except for the fact that it has been extensively touched with white chalk (or watercolour). These marks appear to call for extensive work around the white horse’s tack, the far horse, and across the large tree left and the trees in the middle distance, as well as in the ray at the top left. None of these changes appear to have been attempted by Lucas and none of the subsequent states up to publication show any extensive new work in those areas. The Fitzwilliam Museum has yet another impression P1384R, which also appears identical to P.140.1954, except for the first appearance of a light slipped stroke towards the left. This feature is not mentioned by Shirley with regard to any state, but is easily found to the left of the dark tower vertically cutting the horizon and distant hillside at the foot of a light crepuscular ray. This remains persistent in all subsequent states up to publication. . I do not yet have permission to reproduce the Fitzwilliam proofs, so the image below is from the next in sequence Shirley state (e) but serves here as a marker for the first occurrence of this feature. The signature is elided, but perhaps faintly traceable. This entry was posted on October 22, 2018 by Professor David Hill in Constable and tagged British Museum, David Lucas, East Bergholt, Essex, Fitzwilliam Museum Cambridge, John Constable, Metropolitan Museum New York, Mezzotint, Suffolk, V&A, Victoria and Albert Museum.